Loris Scagliarini's production for the printed media includes articles, short stories, essays, advertising campaigns, brochures and photographs. The articles, essays and short stories have been printed in books and magazines published in Italian, Spanish and English. In addition to books and magazines, Loris' photographs have been published in art show catalogs, calendars and postcards printed in Italian, French, Spanish and English. 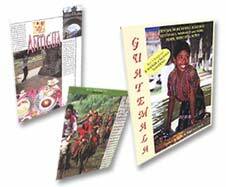 Use the links provided in this page to see magazine covers, photographs from Guatemala or to download FREE color PDF reproductions of magazine articles and book sections.